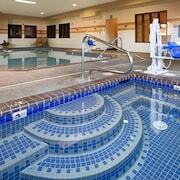 In addition to an indoor pool, Best Western Plus Northwind Inn & Suites provides a spa tub and a 24-hour fitness center. Wired and wireless Internet access is complimentary. Business amenities consist of a 24-hour business center, limo/town car service, and a meeting room. Guests can enjoy a complimentary breakfast. Event facilities measure 1200 square feet (108 square meters). This business-friendly hotel also offers complimentary newspapers in the lobby, a fireplace in the lobby, and dry cleaning/laundry services. Onsite self parking is complimentary. Best Western Plus Northwind Inn & Suites is a smoke-free property. 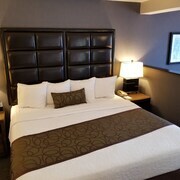 Situated in the business district, this hotel is within 3 mi (5 km) of Cook Park, Tualatin River National Wildlife Refuge, and Tualatin Island Greens. Bridgeport Village is 2.9 mi (4.6 km) away. An indoor pool, a 24-hour fitness center, and a spa tub are available at this smoke-free hotel. Free buffet breakfast, free WiFi in public areas, and free self parking are also provided. Other amenities include a 24-hour business center, a meeting room, and dry cleaning. All 66 rooms offer conveniences like refrigerators and microwaves, along with free WiFi, free wired Internet, and iPod docks. Other amenities available to guests include cable TV, Egyptian cotton sheets, and coffee makers. 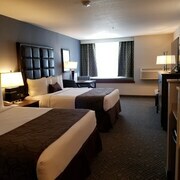 Best Western Plus Northwind Inn & Suites offers 66 air-conditioned accommodations with iPod docking stations and complimentary newspapers. Beds feature Egyptian cotton sheets and premium bedding. Premium cable television is provided. Refrigerators, microwaves, and coffee/tea makers are provided. Rooms have partially open bathrooms. Bathrooms include shower/tub combinations, complimentary toiletries, and hair dryers. 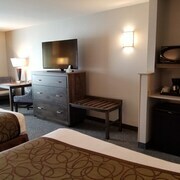 This Tigard hotel provides complimentary wired and wireless Internet access. Business-friendly amenities include desks and phones; free local calls are provided (restrictions may apply). Additionally, rooms include irons/ironing boards and blackout drapes/curtains. Housekeeping is provided daily.